As I reflect on last year’s views, it’s fair to say I got it reasonably wrong! I was correct about there being another leg of the bull market. In the US President Trump’s tax cuts propelled the US economy into stratosphere and the S&P to record highs driven in part by insatiable demand for tech and the FAANGs. However, the strength of the US economy in the second half of 2018 caused all manner of problems especially for emerging markets. The Fed seem to be getting much of the blame for the woes of the last few months, however in their defence they have said all along they’d raise rates four times in 2018, and they’re on track for that. So why did the market wake up in October and panic? As I write this most major markets are down in 2018 with only the S&P 500 up 2.27%. The DAX 30 is down 12.25% and the FTSE is down 6.22%. You’ll hear this from most people in the next few weeks but 2019 will be determined by three key things; Brexit, US interest rates, and US China relations. Of most importance to global markets will be the actions of the Fed. Two rate rises seem likely in 2019 – though if wages rise sharply there may be more, in which case this could trouble emerging markets. US/China relations thawed slightly recently with further tariff hikes postponed for three months – a good outcome to these talks could propel Asian equities next year. Currency movements are one to thing to watch out for and are a common denominator- next year could see some big currency swings as markets digest ongoing news flow. Globally,there aren’t too many positives to look at in 2019 with growth slowing and populism rising. The US will continue to see good earnings growth, but probably half as much growth in 2019 as occurred in 2018. Europe looks like stagnating, especially if there is a messy Brexit. As ever it is Asia, Emerging Markets and Japan that look interesting – both from a price perspective and a growth outlook. The UK on many measures looks cheap. 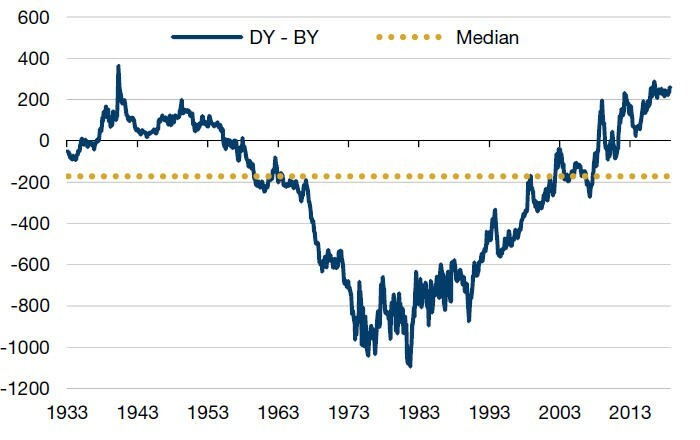 The market sits on its 40 year PE average of about 14x earnings, but that masks companies with dollar earnings on much higher ratings and domestically focused companies on single figure PEs. 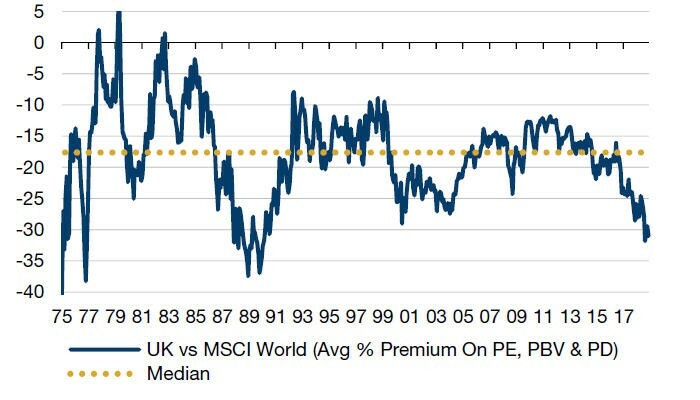 The following two graphs (courtesy of Man GLG) show the UK versus the world on a PE basis and then the UK dividend yield against the Gilt yield. Dividends haven’t yielded this much over Gilts since the Second World War. The dividend yield means you are being paid to hold equities. One of the most fascinating facts of 2018 is that overseas companies are happy to buy out British Businesses – Sky and Shire are two recent examples, but global fund managers won’t invest here. This leads me to believe there is good long-term value to be found in the UK. It’s reasonably simple to position for Brexit…however the outcomes in my view are binary. In other words, a soft Brexit will lead to one outcome and a hard Brexit the other. I wouldn’t bet the ranch either way – sitting on the fence for once and getting splinters is probably the best option! A good soft Brexit will lead to a strengthening currency and a mild stock market bounce – the bounce will be led by domestically focused stocks. A hard Brexit will lead to a sharply falling currency and possibly a stock market fall – it’s less likely the dollar earners will save the FTSE this time. A soft Brexit is still the most likely outcome (despite parliamentary shenanigans) and therefore favours sterling assets and more domestically focused companies. Last year I said that the FTSE would end 2018 at 7400, flat on the year. A mini Santa rally and I won’t be too far off.. I’m actually going to stick with a similar figure for the end of 2019, 7750, as I think a soft Brexit and a bounce is the most likely outcome. This article represents a personal view from Ben Yearsley, and is based on his opinion of economic data from the UK and across the globe. It should not be used for investment purposes and does not constitute advice. For investment advice please refer to your financial adviser. No party should act or refrain from acting on anything contained in this material. Relevant primary materials should always be consulted at all times for all purposes. No statements or representations made in this material, document or at the presentation are legally binding on Shore Financial Planning (Plymouth) Ltd or the recipient and no liability is accepted in connection with this material. This article may not be reproduced or circulated without prior permission. Issued by Shore Financial Planning (Plymouth) Ltd, authorised and regulated in the UK by the Financial Conduct Authority. © Copyright 2018 Shore Financial Planning (Plymouth) Ltd.